RACING from a number of the most important historical meetings from more than 40 years ago can now be viewed publicly for the first time . . . thanks to an avid supporter who captured them on film. From the mid-70s, Oxford-based Michael Bratley toured British tracks and filmed meetings using his cine camera loaded with Super 8 and Standard 8 movie reels. 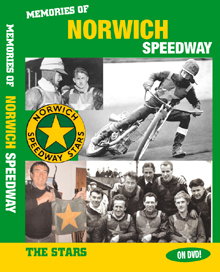 We are delighted to report that Retro Speedway has been very fortunate to obtain possession of these prized gems – footage shot at some 60-plus meetings between 1974 and 1982 – after they were claimed following an advertisement Michael placed in the Oxford Mail. Another former Oxford regular Ann Booker saw the ad' and, mercifully, reacted swiftly to acquire this extremely rare collection before it was consigned to the rubbish skip. 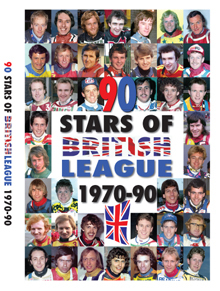 Ann – a familiar face at Cowley who used to look after the riders' catering on race nights – passed them on to her friend, WSRA committee member and ex-Cheetahs rider Pete Seaton, who in turn alerted us to this goldmine. Now, thanks to Michael, Ann and Pete, the results of Michael's initiative will dominate a new series of DVDs called Retro Speedway Cine Classics. The first three off the production line are advertised on the facing page – and you immediately get a sense of the film's rarity value. Australia (in 1976) and New Zealand (1979) enjoyed their greatest day in their speedway history when they upset the odds to become world champions for the first time. The sparse crowds at London White City on those Sunday afternoons were the fortunate ones who saw history unfold – but no-one else did, because neither meeting was televised. With England eliminated before final day in both cases, the TV companies weren't interested in sending even a small crew down to the west London stadium. But, thankfully, Michael Bratley WAS there! He was also at many other important international meetings, including individual World Finals, other WTC finals and qualifying rounds, a World Pairs Finals, Test matches involving the then mighty England and the Wills Internationale at Wimbledon. We are delighted to have been able to include a number of cine clips on our newest releases in the DVD Racving series - MALCOLM SIMMONS RACING and PHIL CRUMP RACING. And being a fan of Oxford, he followed his team home and away filming their British League matches from Bradford and Halifax in the north to Hackney and Wimbledon in the south. Much of what he filmed will feature in an Oxford Rebels 1974-75 DVD that will be advertised soon. When the Rebels switched to White City in 1976, Michael and his camera followed them and kept capturing the action. In our next issue, we will announce details of a compilation White City Rebels 1976-78 DVD containing previously unseen match action footage from the team's three seasons at Wood Lane, including coverage of that momentous day at Wolverhampton in 1977 when Gordon Kennett and co. were crowned British League champions. There is a cornucopia of material to edit and convert from original raw film to DVD format and we're already in full-on production mode. During the course of this year our Cine Classics series will also feature regional compilation DVDs – North-West, Yorkshire, Midlands, East Anglia, London, South-West, Southern, etc – containing action from your local tracks, or, in many cases, now sadly defunct venues. So watch this space!